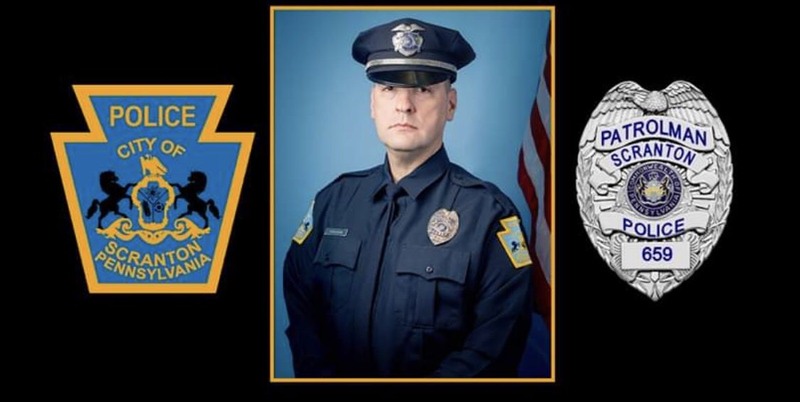 Patrolman Daniel Schaufler, Scranton, passed away Monday in the Hospital of the University of Pennsylvania after a courageous battle with cancer. His wife of eleven years is the former Sheila Bozym Giles. Born in Taylor, he was the son of Harold and Linda Springer Schaufler of Moosic. He was a graduate of Western Wayne High School. Upon graduation, Dan devoted his life to public service. He became an EMT/Paramedic working for Donahue Ambulance Services and later served as Operations Manager for Rural Metro Medical Services. In the aftermath of the attack on the World Trade Center on September 11, Dan immediately volunteered as a first responder and reported to the scene. Realizing his capacity for public service had yet to be fully realized, Dan attended the Act 120 Program at Lackawanna Junior College and honorably served the citizens of the City of Scranton as a Patrolman for 16 years. Dan loved to sketch and paint and would often present his art as gifts to friends and family. Dan’s children were his greatest gift and he cherished his time with them. His passion was spending time with his wife Sheila; but they lived for the hours they spent on the lake fishing. His sense of humor was unmatched and he was a true friend and mentor to many. He particularly loved the time he spent as a counselor at Marley’s Mission. Also surviving are sons Damon and Noah and their mother Darlene Schaufler all of Scranton; step-son James Giles and his wife Alison of Washington, DC; a step-daughter Kathleen Williams and her husband Dan of Aberdeen, NJ; sister Gwen Marie Grier and her husband Kevin of Scranton; grandchildren Libby, Daniel and Westin; numerous nieces and nephews. All attending the funeral are invited to go directly to the church. Mass of Christian Burial will be celebrated Monday at 9:30am in the Cathedral of Saint Peter 315 Wyoming Ave. Scranton by Msgr. Thomas M. Muldowney, V.G. Friends may call Sunday from 2-6pm in the Theater at Lackawanna College 501 Vine Street, Scranton. Casket Watch and Honor Guard services will be rendered by the Scranton Police Department Funeral Detail. Cremation will follow in the Lake Region Crematory, Lake Ariel. Arrangements have been entrusted to and are under the care and direction of the Vanston and James Funeral Home, Ash St. Scranton. Previous Previous post: Frederick J. Dietrich, Jr.
Our thoughts and prayers are with you. Dan was a great supervisor when I worked at Rural Metro and a good person. Dear Shiela and Kathleen- to your whole family, we are so sorry for your loss. May he Rest In Peace. Condolences to his family. My best friend from high school… miss and love you even more. Sure we will miss a good friend like you, Dan. May you rest in peace. Condolences to wife Shiela and the rest of the family. We love you both. Our deepest sympathies to your family. He was a wonderful man and now he’s resting in peace. God bless and keep you all. My most sincere sympathies and much love. Dan was such a terrific guy, his time was too short. Dan will forever be missed by many. Our thoughts and prayers go out to you all. Sympathy to the family. Will remember living with us when he broke his leg, was like another son. My son, Bobby and him were best bro’s. Their high school time together was always with laughter. We will all miss him. Hope you get this because I do not know your address. Gene and I are so sorry. We remember the times we were all living at Ryan Hill. Our condolences to Danny’s family as well. My thoughts & prayers are with you and your family! Thinking of you all during this difficult time. It was a pleasure meeting you and caring for Dan. May he rest in peace. Phyllis and I send our deepest condolences to the entire family. My deepest condolences. Dan was a big part of my life in high school. We remember Dan as a very kind young man who wanted nothing more than to become a police officer. Our condolences to all his family. May he rest in peace.